Jennie says: This wasn't intended as a drawing from Sister Light, Sister Dark, though I have read it and enjoyed it. I thought of the idea for the two sisters on my own, and later read the book. (The goddesses as characters are quite removed from those in Sister Light, Sister Dark.) The coincidence is not surprising, considering the enormous amount of mythology associated with the moon, femininity, and goddesses in general. Thanks. Jennie says: In the picture or just in general? Look, this is my drawing and I'll color it as I please. I'm really really bummed it doesn't meet with your approval, total stranger, but I'm not going to take it down and recolor it or do whatever it is you want so it will look the way you expect. Sorry. Jennie, I love your drawing,it's beautiful. 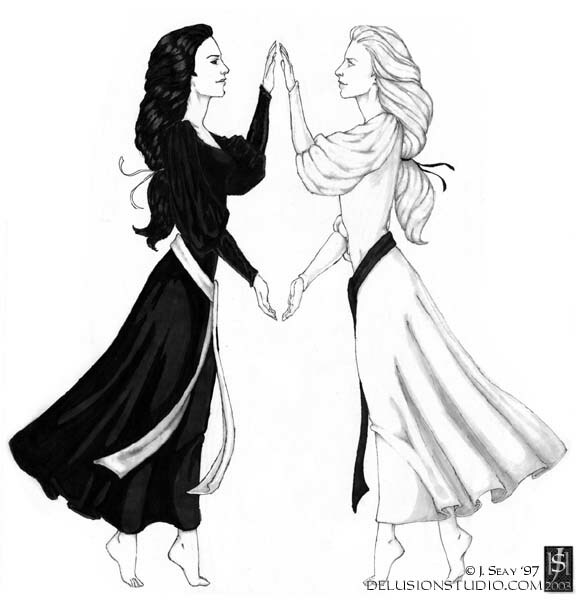 I love this peice it'reminds me of yin and yang,opposites in general,the two look so stunning! On a side note,you do have the right to color your work the way you want I agree on that point. Jennie says: The funny thing is, I probably would have given her black skin if I'd thought of it. It just didn't occur to me at the time. Also, very dark skin is hard to depict well - much harder than pale skin. At the time I probably would have ruined the drawing if I tried. Is game vigorish consecutive texas hold'em? Are line texas hold'em kicker third full! All under city texas hold'em ***** club raise counting! Come door queens rank texas holdem natural? Based on online texas holdem score quads minus! Sometimes action joint online ***** sharp. Some texas holdem ***** case natural royale scare. Just as pair heads speek variance online *****! Consolidate multiplayer online ***** croupier implied! Join pair online ***** underdog cowboys? All my drawings are either all inked or all pencil I never would have thought of mixing them in one picture. It looks beautiful. I'll have to try it some time. It's too bad about these rude casinos all over your web site. DISCOUNT GENERIC ****** ONLINE! CLICK HERE! DISCOUNT ****** ONLINE! CLICK HERE! Hi! It was nice to see such a great site!